The G-Shock line of sports watches from Japanese watchmaker, Casio, is primarily known for its excellent resistance against vibrations and mechanical shocks; hence, the name. 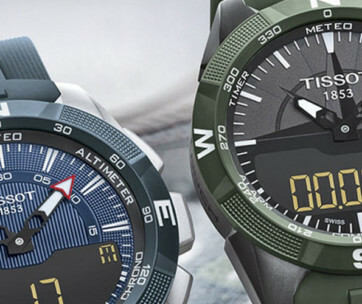 These bulky, muscular, and ruggedly –designed and –constructed wristwatches are great for outdoor adventures and even military activities. It is very popular among US and NATO Special Forces, mountaineers, paramedics, police officers, firefighters, offshore drillers, and even film directors like Francis Ford Coppola and Ron Howard. Carrying in the tradition of Japanese watchmaking ingenuity for the rugged outdoors is the Casio G-Shock GA100-1A1, a tough and reliable military-spec’d watch for the modern adventurer. The Casio G-Shock GA100-1A1 Military Series watch remains faithful to the original design of the famed line of outdoor adventure wristwatches, complete with robust features in a sturdy and rugged design. 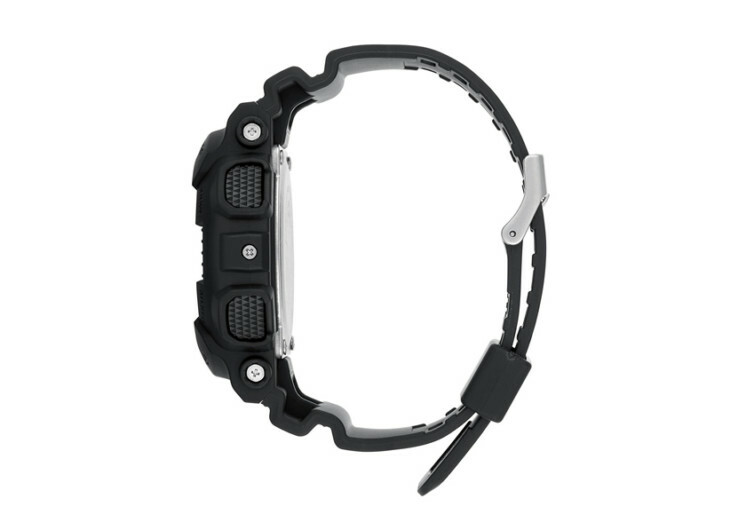 While it is intended for members of the military, the GA100-1A1 is a trustworthy partner of modern-age road warriors, handymen, and even corporate stalwarts. With a combination of digital and analog display, the GA100-1A1 is the perfect timekeeping accessory that can be worn with your conservative getup or your rugged jumpsuit. Unlike other action watches, however, the GA100-1A1 comes with a stationary bezel which can take getting used to especially if you’ve been using a bidirectional or even a tachymeter bezel for many years. This should not really be an issue since there isn’t that many information to dial on the bezel. What the watch promises is ruggedness of built and only the essential pieces of information to get the mission accomplished. 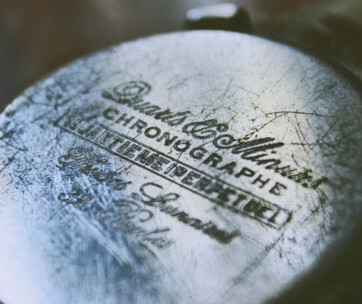 The scratch-resistant mineral dial window is made of premium-quality elements that have been ingeniously heat-treated, affording you unusual hardness and rigidity that will make it impervious to scratches. It is not sapphire crystal, but at least you’ll feel more secure that it is not as cheap as an acrylic. 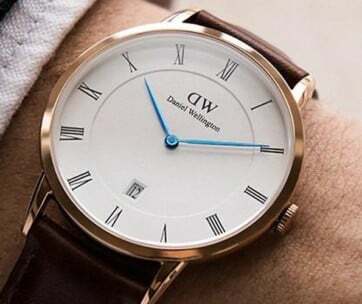 This gives the GA100-1A1 that characteristic elegance typically seen in luxury men’s wristwatches. It may not be powered by mechanical movement, but at least the Quartz movement on the GA100-1A1 should help you see it through a couple of years before you’ll replace its batteries. 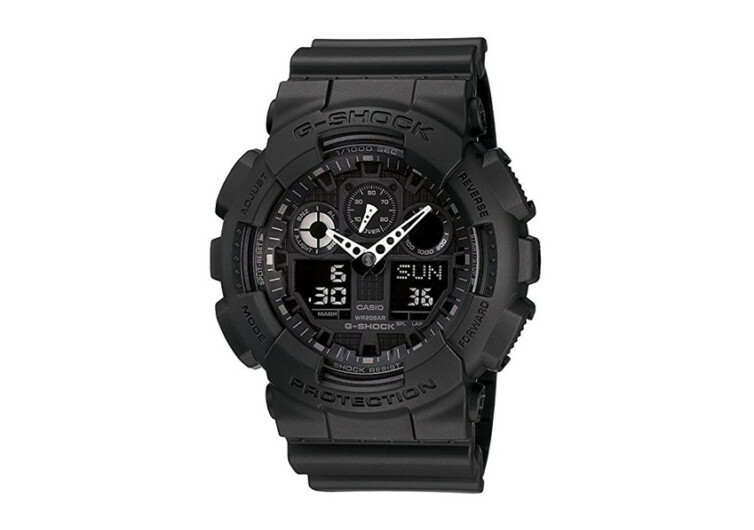 It is not a diver’s watch, but this G-Shock watch has an exceptional water-resistance rating of 656 feet or 200 meters. It’s perfect for occasional swims or even accidental drops in water. The G-Shock Military Series also comes with dual-time display, giving you the time of 48 different cities in the world plus UTC. With 29 different time zones, the GA100-1A1 will keep you updated of time regardless of where you are on the planet. There’s 1/1000th-second stopwatch complete with speed indicator. The Casio G-Shock GA100-1A1 Military Series men’s watch carries on the tradition of excellent watchmaking by the brand. It’s not Swiss, but the Japanese are known for their dedication and commitment to high quality standards, too.